Lee Ingram, CEO of CollegiateTutoring.com, gave his winning pitch to the judges during the Conference on Technology Innovation. 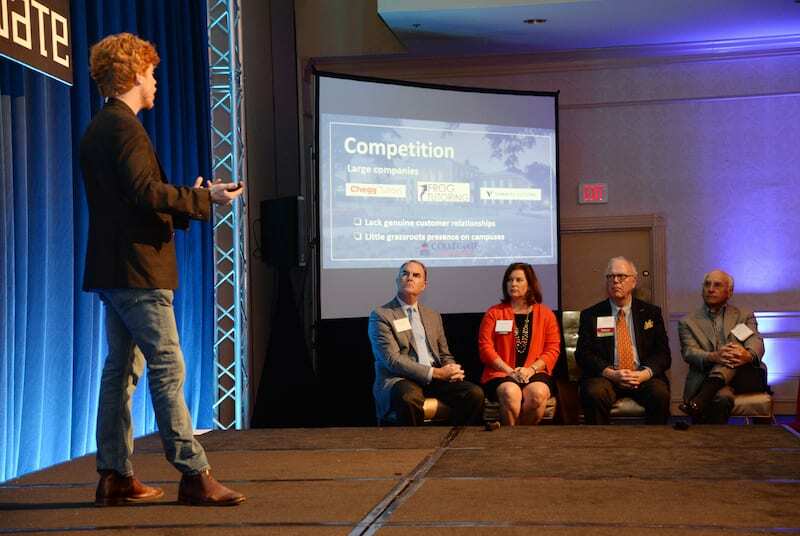 While many college students can benefit from tutoring outside of their regular classes, existing approaches don’t always appeal to the young adults who need those services—something that CollegiateTutoring.com founder Lee Ingram pointed out in his winning presentation in the 2017 Mississippi New Venture Challenge’s Student category. “Students really do prefer peer-to-peer learning, but at many campuses, quality student tutors are not accessible,” said Ingram. He also pointed out that many “tutoring centers” on campuses have big glass windows in public areas—and that some students shy away from what other might assume is remedial help in plain view. CollegiateTutoring.com, which won $3000 from Mississippi New Venture Challenge sponsor Baker Donelson, creates an online system for connecting students with peers who can tutor them through college classes that are giving them trouble. The Oxford-based startup has gained early traction particularly within the Greek system at the University of Mississippi, where sororities and fraternities have proven interested in the ability to offer peer-to-peer tutoring services to their members. 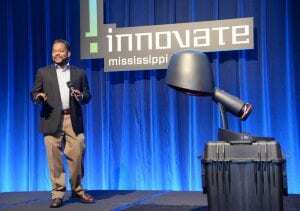 Ingram says the company plans an expansion to the University of Memphis in the next year, followed by Mississippi State University, Louisiana State University and the University of Alabama. Second place ($2000) in the Student category went to Auto-is of Starkville, a startup offering unmanned aerial vehicles that can test connections for wireless Internet service providers; third place ($1000) went to Black Creek Innovations of Starkville, which is developing the TeleNock, a bow-hunting device that uses radio frequencies inside a detachable arrow to display a constant location. Martin McCurtis won the Pre-Revenue Product category with his hair-dryer prototype. In the Pre-Revenue Products category, Momentum Dryer took the $3000 first place prize, sponsored by Littler, with what promises to be a modern-day spin on a classic device—the hooded hair dryer. CEO Martin McCurtis told judges his Madison-based startup, Quantum Flow, Inc., offers “upflow technology” for shortening the amount of time people spend under hooded dryers in salons, while improving the results. “Typical hooded dryers direct hot air down… which basically works against the laws of nature,” McCurtis said. “What the Momentum Dryer does is direct hot air and vapor in an upward direction…” pulling excess humidity out through the top of the device. McCurtis claims it cuts drying time up to half, is more comfortable to sit under and less damaging to the hair that’s being dried. The $2000 second place winner (sponsored by Fuse.Cloud) in the product category was MegaPatch, also Madison-based, offering a unique pothole-repair product made from water-based polymers. Third place went to JUVA, a Starkville-based company offering the ATLAS Fountain, which delivers healthy options to the beverage industry. 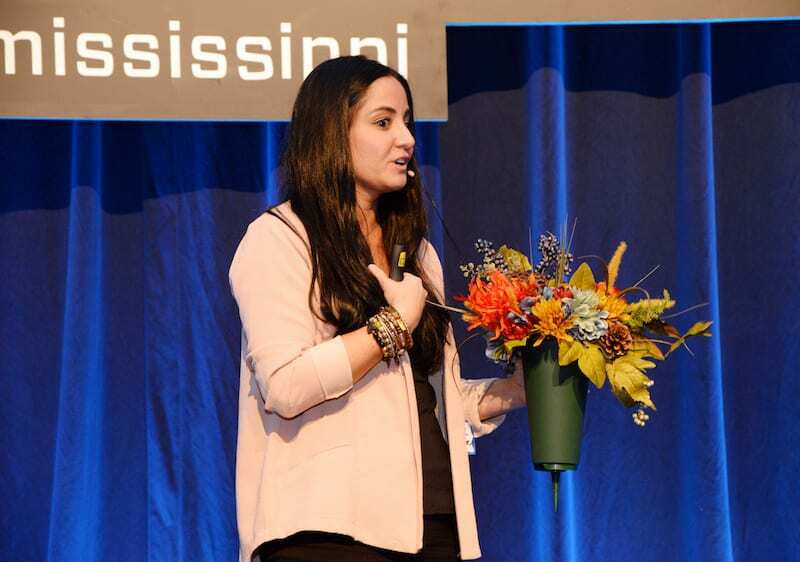 CEO Kristen Allen says her company will deliver flowers to gravesites using an Uber-like model. In the final category, Pre-Revenue Web-based solutions, Jackson-based Flowerstothegrave.com won the $3000 prize sponsored by Bradley. 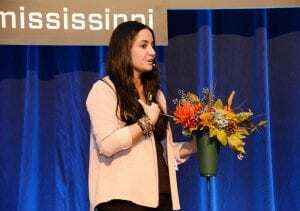 CEO Kristen Allen explained that the startup offers a web-based subscription service that places (and replaces) artificial flowers at grave sites on a regular basis. The flowers are delivered by drivers who take the job in a way that’s similar to Uber or Lyft. “I started doing my homework and realized that there wasn’t a company that delivers flowers to the grave,” said Allen. While some services create gravesite flowers—and others deliver them to funeral homes or graveyard offices—the expectation is still that family members or friends will replace them at graveside. But Allen notes that some family members may be too upset to visit grave sites, or live too far away. 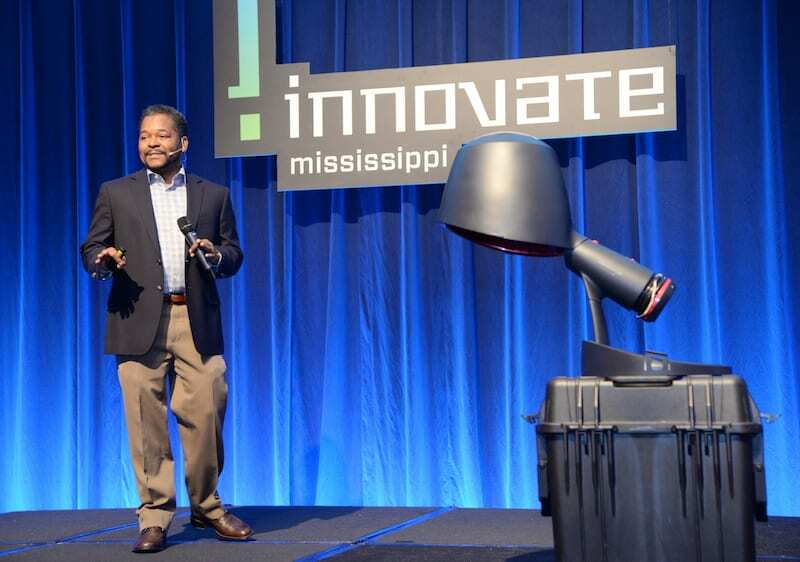 The Mississippi New Venture Challenge took place on October 17, 2017 at the Jackson Downtown Marriott; the winning presenters then pitched again during the “Pitch Tank” event at the Conference on Technology Innovation on October 18, 2017.